We are winging our way over the Atlantic, en route to Nigeria and Ghana. Our friends, the Kipharts, are with us, but in the front end of the plane. Our friends, the Olopades, are in Nigeria already and will meet us when we arrive. This is our fifth trip to Ghana with the Kipharts (our third with the Olopades joining us) and the second trip of the six of us together to Nigeria. We were to have made this trip in late August – early September, but the Kiphart’s and we canceled because of the Ebola threat. The Olopades went. Being doctors, they had a role to play in Nigeria. In addition to our usual visits to remote rural areas, meetings with government and university officials and trips to medical facilities, we have a special reason for going to Nigeria right now. One of the Olopades’ daughters, Feyi, is being married tomorrow in Lagos, and we all will celebrate (along with about 400 invited guests and probably as many crashes). We are all very excited. The six of us will be dressed in our Nigerian wedding costumes, for which we were measured a couple of months ago in Chicago, by a Nigerian seamstress. How neat is that? Step 2: don’t bring too much hand luggage. Nigerians are notorious for bringing too much stuff back with them, so they are extra strict and will take your bags with you. No matter how tempted you are to be the last person to board, do not let this happen. Once the overhead space is full you are screwed. In the event that you do have to give up your carry on, make sure to carry a spare lock. Step 3: have respect for elders. Older Nigerian people are revered and may have very strange expectations of you. The same for pregnant women or women with small children. They may ask you to do any of the following: carry their handbag, fetch things from the overhead bin, change the channel on the tv, unzip their coat, etc. Do not be alarmed. Comply, smile, and move on. The only thing I’d put my foot down for is when someone asks you for your aisle seat when they clearly have a middle one. I’m hoping that older, non-Nigerians are revered, too. One can never get too much reverence. The awful things that are going on with the Boko Haram kidnappings and killings are in the far north of the country, a long way from where we’ll be. Ghana is not shown on this map, but it’s west of Benin. To give you the big picture on Nigeria, we were struck by how it bestrides sub-Saharan Africa as a kind of colossus. The population of Lagos alone is two-thirds the population of the entire country of Ghana. 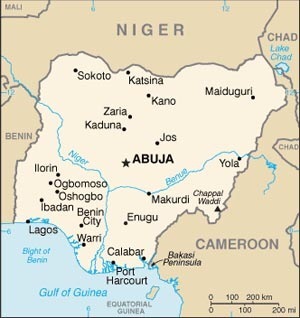 In a sense, Nigeria is three countries, the Ibo-dominated, oil rich Southeast (which seceded as Biafra in the 1960s, resulting in a 30-month civil war that killed more than a million), the Yoruba West of the Country that includes Lagos, the country’s engine, and the Hausa North, which is largely Muslim, agrarian and military. These countries have different languages and cultures. There were originally twelve states in the three regions, but those twelve have now morphed into thirty-six, each with a government, and each (except Lagos) largely dependent on an oil-rich federal government for funds. Small wonder, then, that corruption is a big problem. Funmi and Sola Olopade are both Yorubas, and proud of it. Funmi’s father was an Anglican minister and Sola’s a businessman. Both were highly educated in the best and most competitive schools in Nigeria. The Olopades are both doctors, and run the Global Health Initiative at the University of Chicago. If you want to know something about Funmi, I encourage you to take a look at http://www.the-scientist.com/?articles.view/articleNo/36681/title/Cancer-Knows-No-Borders/. Sola is equally accomplished, but does not have as good a press agent as Funmi. The Olopades are both dual citizens. It’s important for us to keep in mind that in dealing with Funmi and Sola, we are talking to the upper strata of Nigerian society and not to think that they are representative of the population as a whole. I’ll fill in more about the Olopades as we go though Nigeria together. Prior to our last trip to Nigeria, I wrote a fair amount about Nigeria, which you can find in my earlier blog, if you are interested. For those of you who are too lazy or not interested enough to look back (and I mean “lazy” and “not interested” in their non-pejorative sense) or want to focus on what’s key, I’ll repeat Sola’s answers to three questions I put to him before our last trip. What five things should readers of the blog understand about Nigeria? 2. What are Nigeria’s greatest strengths/assets? 3. What are Nigeria’s greatest problems/challenges? So, it just turned midnight. Well, actually, it’s a bit of a metaphysical question when midnight is/was. It’s midnight Houston time, but we’ve been flying east for a few hours, so it must actually been later than that. Why Houston time? We flew to Houston, where we got a non-stop to Lagos. Why are there non-stops from Houston to Lagos? Oil. Chimamanda Ngozi Adichie, which is excellent, and the perfect book to be reading en route from the U.S. to Nigeria to attend the wedding of a Nigerian-American. The long flight to Lagos (over 11 hours) will allow me to make a heavy dent into the book. Flight over on United’s quiet new Dreamliner arrived ah hour early. Customs was smooth, but rather long wait for luggage. We were met at the airport by Sola and two drivers and escorted to the Blowfish Hotel on very upscale Victoria Island. Light traffic on New Year’s Day holiday. 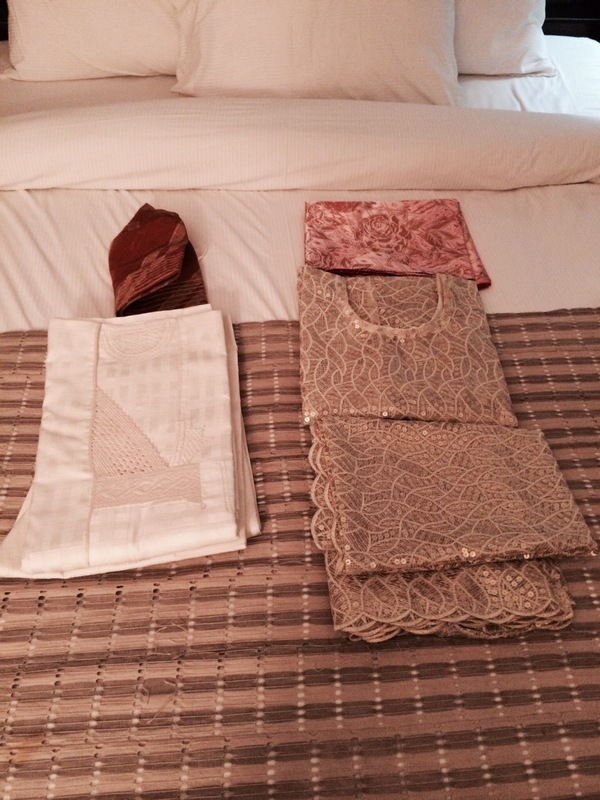 Checked into hotel and our wedding costumes were folded on the bed. Walked half a block to what turned out to be a terrific Japanese restaurant. Funmi and Sola walked us over, but did not stay. The Kipharts and we had dinner with Yemi, who was an advisor to Funmi in college and a great character. She lives in England, where she used to work in HR for a large foundation that served people with disabilities. In more recent years, she’s moved to Essex, where she volunteers and conducts focus groups for people with cancer and their families. 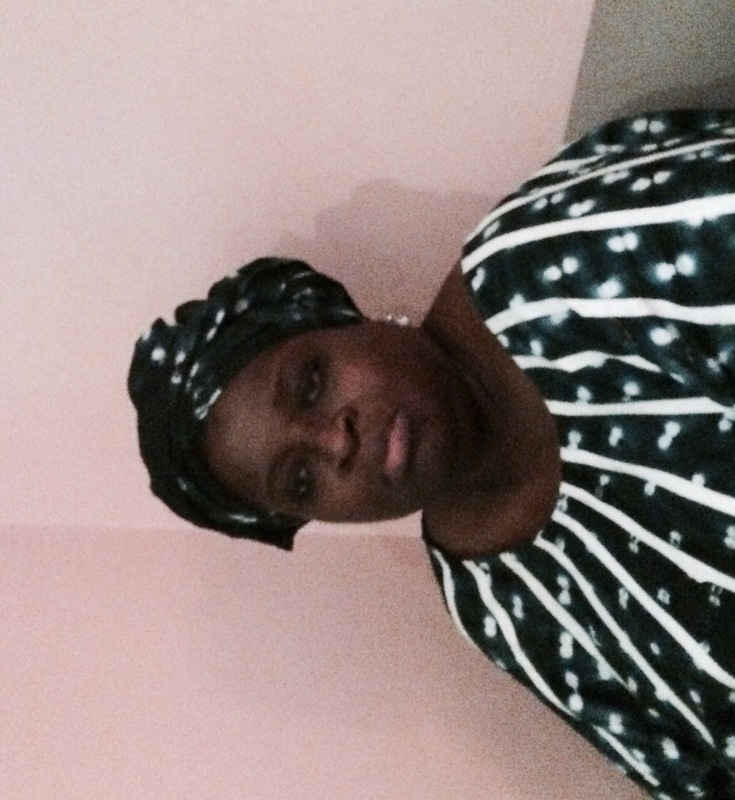 She returns to Nigeria four times a year to fulfill her responsibilities as chief of a group of some 3000. She also travels to Kuwait to visit her son, who is in finance there and his wife and daughter. Yemi was a most entertaining dinner companion. We returned to the hotel, where we will retire very early in the hopes of being wide awake for tomorrow’s big wedding day. Fabulous. So excited to be part of your latest adventure. Happy wedding and have a wonderful time. Look forward to the next blog. just wonderful to read, I am learning and laughing!! I loved reading your blogs—learning and smiling! Happy new year…looking forward to some selfies of the ‘Wedding Guests’! Good opening post; will follow for sure. GZ finishes NU this term; Tully an Improviser (successful) in Chicago. Love to Carol. Awesome. I can’t wait to hear and see and learn more. Did anyone on the plane ask you to help them in any of the ways you mentioned?